Rendering courtesy of Phu Hoang Office and Rachely Rotem Studio. For perhaps the perfect synergy between familiar Arts content and what one might expect from Design Thursdays, we're taking a virtual journey to beautiful, sunny Miami Beach, where Art Basel Miami Beach is gearing up for its December 2nd opening. For those not familiar, Art Basel Miami Beach is the sister event of Switzerland's Art Basel, probably the most prestigious art show worldwide. Art Basel Miami Beach combines an international selection of top galleries with an exciting program of special exhibitions, parties and crossover events featuring music, film, architecture and design. Everyone is speaking about the much-anticipated Exhale Pavilion, the winning entry for the Art Basel Miami Beach and Creative Time Oceanfront Competition, designed by Phu Hoang Office and Rachely Rotem Studio. While both Phu and Rachely are currently onsite in Miami supervising construction, they were kind enough to take some time to share with me (and Huffington Post readers) some information and insight into this remarkable project and to provide some behind the scenes imagery for what's underway. Jacob Slevin: Please describe the Exhale Pavilion in 140 characters or less. Phu Hoang and Rachely Rotem: Exhale Pavilion, which covers a 25k sqft beach site, literally shifts with the weather, producing an open, flexible and dynamic environment. Jacob Slevin: How did you both meet? Phu Hoang and Rachely Rotem: Rachely is an Israeli architect with a design practice in New York and Tel Aviv. Phu was born in Vietnam and raised in the U.S. We met in New York, where it is possible for such different cultures to find a common ground. Part of that common ground was that we both were educated -- though at different times -- at Columbia University. Photos courtesy of Phu Hoang Office and Rachely Rotem Studio. Jacob Slevin: What does your co-design process look like? Is everything a joint exercise or possibly a little bit of solo ownership scattered about? Phu Hoang and Rachely Rotem: Our creative collaboration is very synergetic in its nature. In our projects, we bring together our own research and expertise into our design. For example, Rachely is fascinated with the possibilities that interactive architecture can bring to buildings. Phu, on the other hand, is interested in designing radical relationships between buildings and their environments. This is more than "sustainability"--it is about thinking about the environment as an experience. These two separate interests of ours are synthesized together in the Exhale pavilion when the public can dynamically interact with the wind forces on the site. In this manner, it is difficult to separate one interest from the other-- this is when we know that a design idea "works." Jacob Slevin: What references or case studies did you look to when first beginning design? Phu Hoang and Rachely Rotem: Given the beachfront site, we were fascinated by the effect of bioluminescence that occurs naturally with algal blooms in the ocean. Algal blooms are naturally occurring events in which there is a rapid increase of algae in a water system, often caused by excess nutrients, such as phosphorus. The blooms change form with the ebb and fl ow of the tides, creating large swaths of water that appear bright blue or green. At night, the algae become bioluminescent--resulting in wave breaks that glow in the dark. Jacob Slevin: Site. Weather. Density. Light. Time. Material. These variables all seem to play a substantial role in your design process with the Exhale Pavilion. Please rank these items based on priority for you, and briefly describe how each influences the end product we will see in December? Phu Hoang and Rachely Rotem: We prefer to describe these variables as interrelated and non-hierarchical elements in our final design. Since we were designing a public space, we were particularly interested in the potential interactions between the visitors and the architecture-- as well as the environment in which it is sited. The Exhale pavilion uses two types of rope to create these interactive environments. Some ropes are reflective while others are phosphorescent; together they produce a canopy that shimmers and glows in the night. The reflective ropes will shimmer as the night winds move them. 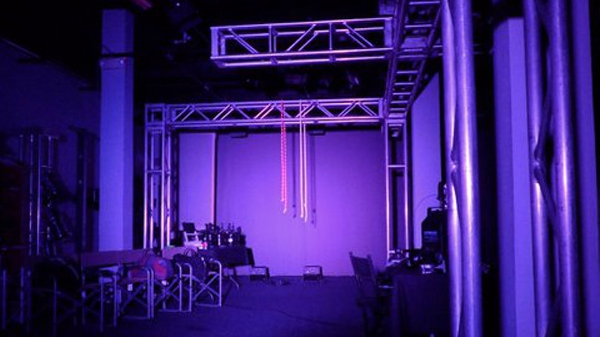 When the wind reaches a particular speed, it will momentarily activate specialty ultraviolet lights, "charging" the glowing phosphorescent rope. Rather than relying on fixed relationships, we were staging possibilities for interactions between the public with the wind, the ropes and the light. Renderings courtesy of Phu Hoang Office and Rachely Rotem Studio. Jacob Slevin: The Exhale Pavilion is a living and breathing space. What should attendees pay attention to while visiting the Pavilion? Phu Hoang and Rachely Rotem: Given that we designed for possibilities and not for fixed outcomes, visitors could become aware that the wind and rope interactions change each night depending on the wind conditions. In heavy winds, the pavilion will "breathe" more actively while lighter winds will have a more calming effect. Visitors should also pay attention to our floating ropes installation. In addition to responding to the environmental site winds, the installation includes user responsive wind speed sensors. They are mounted at human height to respond directly to users' behavior. 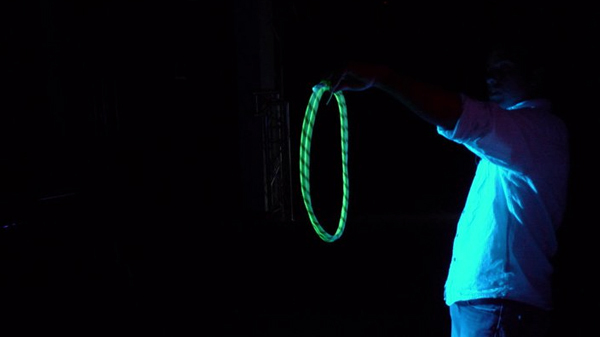 When someone blows on a sensor, it momentarily "charges" the field of nearby glowing ropes. Jacob Slevin: Please describe the technology systems at play. Phu Hoang and Rachely Rotem: We are excited by technology that is both "high tech" and "low tech." Again, it is in the interactions between the two that we find incredible creative potential. The "low tech" is with the reflective rope that we have designed with the manufacturer. 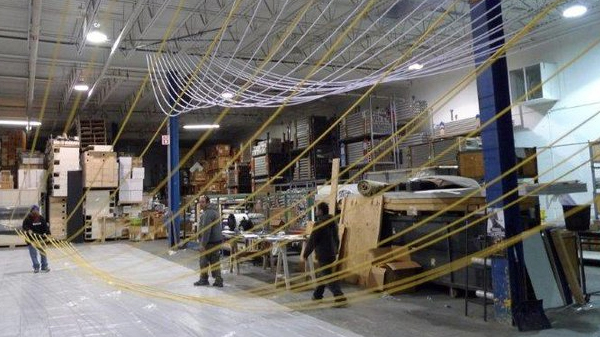 This rope is woven with a maximum amount of reflective tracers--which will make it "shimmer" in the night. An example of "high tech" is the interactive wind speed sensors that detect wind conditions and sends this signal to a computerized light control system. In the interaction between high tech and low tech, we aim to reconnect to the ordinary-- in its nature, it is changeable and unstable. We want to be conscious of and excited by everyday events. We use technology to enhance the ordinary rather than to neutralize it. Jacob Slevin: Art Basel Miami Beach is possibly the most highly attended Art Event in the United States and the Exhale Pavilion is at the forefront of the celebration. Do you want attendees to perceive this Pavilion as a piece of art itself? Or rather a piece of architecture housing art? Or both? Phu Hoang and Rachely Rotem: We do not see the Exhale pavilion as an art piece. We are designing environments that provide spaces for the art as well as potential interactions between our architecture and the art. It has been an incredible experience to work with the Art Basel Miami Beach organization and Creative Time, the legendary New York art foundation. We are very excited by the art programs curated by Creative Time--each night is organized by a different city with an exciting and developing art scene. We believe that each night will also have a different relationship between the art and the architecture that we have designed. For example, one night will have a dance piece uses the entire length of the site while other nights will have performances staged below our "rope towers." Jacob Slevin: What happens to the pavilion after the Art Basel Miami Beach show ends? Phu Hoang and Rachely Rotem: We designed for both the "life" of the Exhale pavilion as well as its "after life." Especially when designing for an event that lasts for just a week, the lifecycle of the materials used is very important. All seven miles of rope will be donated to a non-profit organization. All the concrete bases and steel will be donated to the Department of Environmental Resources Management in Florida. They will be used to form an artificial reef in the ocean waters off of Miami Beach. So, the pavilion will be used to create an underwater environment for sea-life and scuba divers! Jacob Slevin: What's next for each of you? Phu Hoang and Rachely Rotem: Designing the Exhale pavilion was a very unique experience and process for both of us. While we enjoy designing for large public audiences, we also design more intimate experiences and environments. We anticipate a future in which we continue to design at a wide range of scales--this is an important facet of our collaboration together. Photo courtesy of Phu Hoang Office and Rachely Rotem Studio. Phu Hoang is the Founder and Principal of Phu Hoang Office, an award-winning New York-based architecture practice with projects in architecture, interior, and exhibition design. Phu Hoang Office won the Architectural League Prize in 2009 and the design work of the practice has been published both nationally and internationally. Phu holds a Bachelor of Science degree from the Georgia Institute of Technology in Atlanta, a Master of Architecture degree from Columbia University, and currently teaches in the graduate architecture program at the University of Pennsylvania. Prior to establishing his practice, Phu held a project director role in the international design practice Bernard Tschumi. Rachely Rotem is the founder and principal of Rachely Rotem Studio, a New York and Tel Aviv-based design practice with projects ranging from urban environments to interior and furniture design. Rotem holds a Bachelor of Architecture degree from Technion in Haifa, Israel, a Master in Advanced Architectural Design from Columbia University and currently teaches at the Parsons New School for Design. In 2004, she won the 'Catch the Light' international competition (with LoT) for the 2004 Athens Olympics and has received international awards and prizes throughout her career including the Lowenfish Prize and the William Kinne Fellows Prize.